Stranger Cole / Leroy Sibbles - The Time Is Now / Revolution. Vinyl EP. Bleep. The Wackies reissue train rolls on with this repress of a 1978 single. The pedigree on display here is mighty impressive - Stranger Cole has cut many a ska anthem in his decades in the game, while Leroy Sibbles can claim to have played right-hand man to both Clement ‘Coxsone’ Dodd and Lee ‘Scratch’ Perry. Perry’s influence looms large over this one, with the pair of singers both tackling his ‘Tight Spot’ rhythm. ‘The Time Is Now’ and ‘Revolution’ are calls to action, though Cole’s tenor has a rootsy feel while Sibbles shows off a vocal style more indebted to the American East coast. 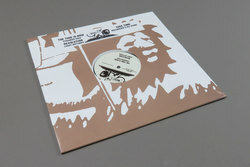 Bull Wackie’s All Stars take the riddim to task on the B-side.